Low back pain is one of the commonest complaints in the UK and costs millions of pounds in lost production and time off work. Over eighty percent of people will have low back pain at some point in their lives, and nearly everyone who has low back pain once will have it again. Not many people who feel pain in their low back have a serious back problem, with 90% of people who experience low back pain for the first time getting better well within 6 weeks. Occasionally people with low back pain go on to develop chronic low back problems. The low back or LUMBAR SPINE is made up of 5 vertebrae (L1-L5) sitting on top of a triangular larger series of fused vertebrae called the sacrum. The vertebral bones are separated by 5 discs, which are like toothpaste contained within a bag of intertwined rubber bands, and absorb the shock on the low back.The low back is curved slightly backwards, this is called a lordosis. Strong muscles arranged in layers, and ligaments (tough fibrous bands that hold the bones together) keep the low back stable.The spinal cord runs through the middle of the vertebrae and the nerves that go to the legs come out between the vertebral segments. An intervertebral disc is made up of the central toothpaste like nucleus, and the tough rubber band like outer bag, called the annulus. Two Facet joints are located on the back of the spinal column the alignment of which allows you to bend forward and back. There are many reasons for low back pain ranging from a minor ligament strain to more serious conditions such as cancer or a bad infection. Most back problems are a result of wear and tear on the spine over a period of time. Smoking and genetic reasons can lead to premature wearing or degeneration of the low back. As we age the discs become thinner as the central nucleus starts to dry up (See article on Lumbar Spondylosis), and the space between the vertebrae narrows. This compresses the facet joints along the back of the spinal column damaging the joints and eventually leading to arthritis. As we age the nucleus may push through the torn annulus and on to the spinal canal. 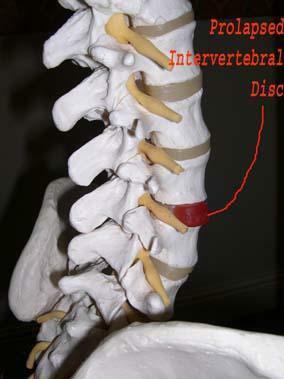 This is called a slipped or herniated disc. (See article on slipped discs). As the degeneration around the disc gets worse, part of the damaged disc takes in calcium causing the formation of bony spurs called osteophytes. These osteophytes can cause problems by pressing on the nerves of the spine where they pass between the vertebrae, causing pain, numbness, and weakness in the lower limbs and feet. The facet joints along the back of the spinal column join the vertebrae together. They are meant to guide the movement of bending forwards but are not meant to weight bear. When a disc loses its height, the vertebrae become closer together causing the joints to rub together, gradually causing pain, inflammation and arthritis. These conditions are when one vertebra move forwards (or backwards) on the one below it causing a shearing of the spine. This can lead to mechanical pain of the supporting structures or to nerve pain as the space, where the nerves to the legs come out, becomes narrower. These conditions can be caused by wear and tear, a trauma to the spine (such as high board diving), you can be born with it, or you can develop it as you are growing. This condition occurs when the middle part of the spine or vertebral canal becomes narrowed. Often this is due to a calcification or hardening of the ligaments within the spinal canal, and is often seen because of a genetic or familial malformation of the vertebrae.This often leads to pain and numbness in the buttocks and legs and weakness in the muscles supplied by the nerves. People with this problem often find they can only walk bent over, and only for a few hundred yards without pain. This is rare and is often due to an infection of the disc itself. Many conditions can affect the low back such as Rheumatoid Arthritis, Ankylosing Spondylosis, etc, etc, etc.. If your spine doesn't form properly at birth or as you grow, this can lead to mechanical back pain later in life. This is a condition where the density or thickness of your bones reduces leading to discomfort and possibly a fracture or breaking of the vertebrae. It is unusual to get a primary cancer in the spine but more commonly a secondary cancer from a tumour elsewhere can be found in the spine. Secondary tumours from Prostate, breast, kidney, lung, thyroid cancers, etc most commonly travel to the spine. THIS is a RARE reason for back pain. Although low back pain can be serious, the vast majority of injuries are not and can easily be helped by your Osteopath. He should normally be able to reduce your symptoms to a pain-free level and give you advice and exercise to help prevent future problems. This is the most common condition that Osteopaths treat and nearly always a patient can be helped by carefully prescribed Osteopathic treatment and advice!